Okay...now we're talking. 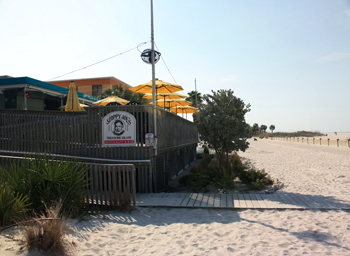 The best beach bars on Treasure Island FL are pretty much wherever I walk up from the beach and sit down. No lie. Treasure Island, along with St. Pete Beach have a couple of outstanding choices for those who really want to enjoy the Florida beach lifestyle. Sloppy Joe's and Caddy's have the strongest local following. They are easily accessible from the Gulf side, have good parking space if you are driving, and have good food with friendly service. It is nice to be able to relax on a date and wait on the sunset. You hear muted chatter, music, and get to experience the breeze blowing off the water. We have always been fortunate to get great food. I really like this place. 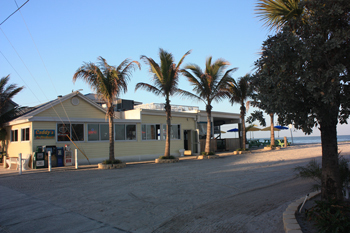 Located right in the Bilmar Beach Resort , it's truly one of the best beach bars I frequent. Only a few hundred yards back to the north from the County Park public beach access on Treasure Island, you can walk it in just a couple of minutes. There's even a nice sidewalk between the parking lot and the beautiful wide beach to get you there. It's got plenty of seats and great menu items. It's not nearly as crowded in the early afternoon as it is 45 minutes before sunset. Lots of local folks show up for the seafood and to toast the end of another day in Paradise. Caddy's On The Beach is like a Treasure Island icon. To me, it is a great beach bar because so many locals enjoy meeting there. Cheering the sunset is like a cult following here at Caddy's. It has an upper level, a lower level, chaise lounges and tables right out in the sand. Parking can be a problem in the evenings, but you can walk there (from Sloppy Joe's) in about 15 minutes. Just head south, you'll find it. This place is real popular with the college crowd during Spring Break and when the universities let out for the summer in May. Otherwise, the afternoons are pretty tranquil on the weekdays and you can lose yourself in an ice cold draft real easy. The owners take pride in the cleanliness of the beach out back. Each morning they have guys with hand rakes, as well as a small tractor with a beach rake, to landscape the sand and keep it soft. Classy. Return to the Treasure Island main page from Best Beach Bars page.